To learn how to use Excel to do calculations, let’s say we wanted to create a new column that contains the value of the color (difference in magnitudes) u-g for each star. 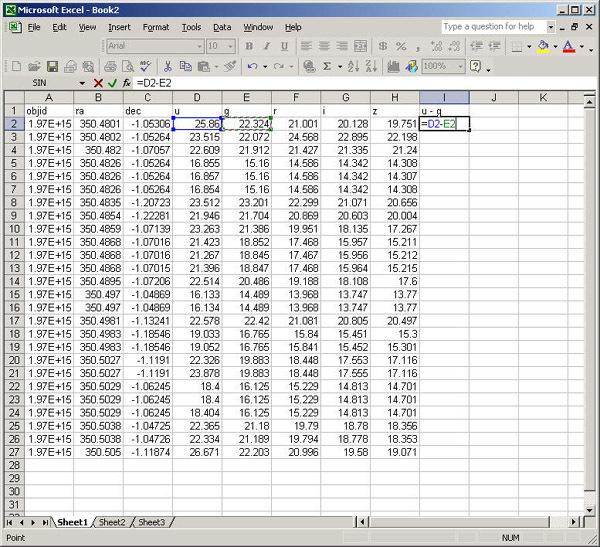 Hit Enter and the spreadsheet will calculate u-g for that cell. Next, select all cells in the u-g column (except for the label). Click the Edit menu. Select Fill and then Down. The entire column will now have the u-g value for the star in its row.